As you know, we are eagerly working towards our ultimate adventure. This means that our interests are regularly sparked by talk of different types of catamarans. I have already told you about our main choice, the Catana. More recently, my interest has been sparked by Le Breton Yachts. I had never heard of them before. When they linked to us on Twitter, I started doing some reading. It sounds like an amazing boat (I have focused on the SIG45, as the others are way too big for our purposes). The reviews are great. However, they all seem to focus on the speed, as the design has tried to retain the racing abilities of this catamaran, with some discussion about the comfort inside. It’s great that they have combined racing with cruising, but I can’t really find any details about their blue water abilities. Having a very fast boat for open water crossings would be perfect. The less time out there, the less chance of getting into trouble. That doesn’t necessarily mean that the boat will hold up well for long ocean crossings. I can’t really judge the SIG45 without reading a review about that. The design sounds like it would handle it quite well. As amazing as the boat sounds, the main downfall is the open bridge deck. We are very aware of how damaging the sun can be to our skin. It seems 10 times stronger when reflected from the water. Being the type of people who would rather sit outdoors, this would probably be unsuitable. Despite that, the living quarters look amazing!! In saying that, the Catana also has no covering over the Helm. That would also be an issue, but probably easier to rectify. So many thoughts running through this blonde head of mine. The best thing we can do is go by the reviews, and talking to those who have experienced the boats. 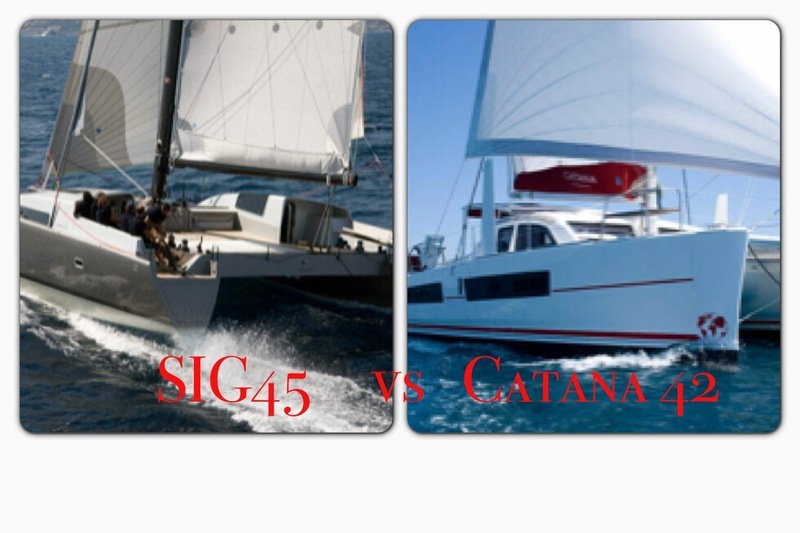 It has been easier to receive reviews about the Catana given they have been around for much longer. It would be nice to hear from someone who has experienced the SIG45 as a cruiser rather than a racer. Have any of you cruisers out there come across them? Please contact us via comments or our contacts page if you have. The more information I can gather, the better. Because of the bridge deck issue, the Catana is still #1 choice for us. After all, Catana claims their modern design is unsinkable. I’m not sure I’d like to be the one testing that out. We can’t wait to go see it at the boat show in a couple of weeks! I feel bad saying that. Le Breton Yachts sound amazing and it would be a fantastic experience to sail on one. I look forward to keeping up with their progress through twitter! Click on the link above and check out the SIG45. It’s a good looking boat, that’s for sure!! By the way, I realise we won’t be getting a brand new boat (one can only dream) but for the photos, it is easier to find new boats than used ones. the le breton looks nice, and the guys on cat to fold seem to like their accommodations which are similar, down in the hulls without a bridge deck cabin, but if you plan on cruising long term, you may miss the cabin, especially when the weather isn’t so good, or when it is and you need some shade! think the catana would see you better in the long run for cruising… have you looked at any used morelli and melvin cats? seen a few on yachtworld, they are fast, well built and comfy, worth checking out! Will definitely check them out!! Yeah it’s the bridge deck thing that bothers us.